PMC’s radiology services — Nuclear Medicine, Magnetic Resonance Imaging (MRI), Computed Tomography (CT), Positron Emission Tomography (PET) and Mammography — have received three-year accreditation from the American College of Radiology, recognized as the gold standard in diagnostic imaging. PMC AVP of Radiology/Interventional Radiology Joni Fields said qualifications required to be accredited include image quality, equipment performance, safety standards for staff and patients, quality assurance and quality control program, as well as personnel qualifications for physicians and technologists. The Radiologists and staff at Pikeville Medical Center provide the highest quality diagnostic and interventional services in a caring and efficient manner. The Diagnostic Imaging Department has been a crucial service at PMC for more than seven decades. Our board certified Radiologists are experts who consult with specialists in other departments to provide care to every patient every day. Radiologists work with state-of-the-art equipment, skilled technologists and nurses, to perform tests and interpret results in the imaging and treatment of disease affecting patients of all ages. Of importance to many physicians, the turn-around time for the PMC Diagnostic Imaging Department has been tremendously reduced. With new digital imaging technologies such as Digital X-rays and the PACS Image Archiving System, turn-around times have been greatly reduced, and, in many cases, almost totally eliminated. MRI(magnetic resonance imaging) uses radio waves and a strong magnetic field rather than x-rays to provide clear and detailed pictures of internal organs and tissues. MRI has been used to study almost every joint in the body including the knee, shoulders, spine, hips, wrists, and hands because it gives such clear pictures of soft tissue structures near and around bones. MRI is widely used to diagnose sports-related injuries, as well as work-related disorders caused by repeated strain, vibration, or forceful impact. PMC features 3 MRI machines including the Espree 1.5T MRI and the Verio 3.0T MRI which provides claustrophobic and larger patients with more room than ever! CT (computed tomography), sometimes called CAT scan uses special x-ray equipment to obtain many images from different angles, and then join them together to show a cross-section of body tissues and organs. It can show bone, soft tissues, and blood vessels in the same images. Pikeville Medical Center now has 2 Toshiba Aquilion One 320 slice scanners. To our knowledge, we were the first and only medical facility in the world to have 2 of these scanners on the same campus. 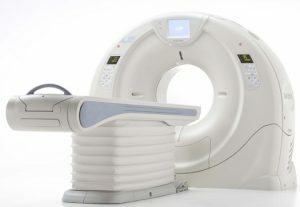 We also recently installed a large bore Toshiba Aquilion scanner in our Oncology department. Bone density scans are used to detect osteoporosis (a disease characterized by low bone mass and structural deterioration of bone tissue) before a fracture occurs, and to monitor changes in bone density in response to treatment. Osteoporosis is often called the “silent disease” because bone loss occurs without symptoms. People may not know they have osteoporosis until their bones become so weak that a sudden strain, bump, or fall causes a fracture or a vertebra to collapse. Fluoroscopy is a technique for obtaining live X-ray images of a patient. The Radiologist uses a switch to control an X-Ray beam that is transmitted through the patient. The Radiologist can watch the images live on a TV monitor. Fluoroscopy is often used to observe the digestive tract. Nuclear medicine uses safe, painless, and cost-effective techniques both to image the body and treat disease. Nuclear medicine imaging is unique in that it documents organ function and structure. Nuclear medicine uses very small amounts of radioactive materials or radiopharmaceuticals to diagnose and treat disease. The amount of radiation from a nuclear medicine procedure is comparable to that received during a diagnostic x-ray. PET (Positron Emission Tomography) Scan is rapidly becoming a major diagnostic imaging tool used predominantly in determining the presence and severity of cancers, neurological conditions, and cardiovascular disease. 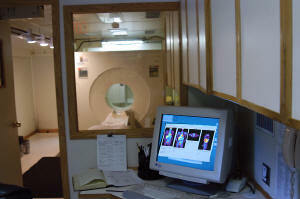 PET images demonstrate the chemistry or organs and other issues such as tumors. It is currently the most effective way to check for cancer recurrences. Ultrasound imaging is a method of seeing inside the human body through the use of high-frequency sound waves. The sound waves are recorded and displayed as a real-time visual image. No radiation is involved in ultrasound imaging. 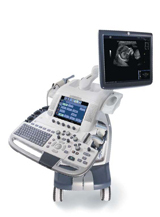 Ultrasound is a useful way of examining many of the body’s internal organs, including the heart, liver, gallbladder, spleen, pancreas, kidneys, bladder, and is also widely used to view the fetus. X-rays are a form of electromagnetic radiation just like visible light. They can be emitted by specially designed machines which create photons (individual X-ray particles) with high energies which can pass through the body and be detected by film. Structures that are dense (such as bone) will block most of the photons, and will appear white on developed film. Structures containing air will be black on film, and muscle, fat, and fluid will appear as shades of gray. Pikeville Medical Center now features a Digital X-ray system and PACS (Picture Archiving System). Digital X-rays will have a major speed advantage over traditional film X-ray images. Digital X-Rays can be transferred to almost anywhere within seconds. Not hours. With the PACS systems, physicians miles away can see diagnostic images mere seconds after the patient has been scanned. In addition, there are multiple locations operated by Pikeville Medical Center which offer radiology services. 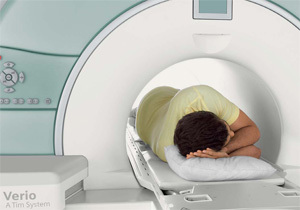 The Diagnostic Center offers patients X-ray, bone density and a dedicated PET scanner.